The quest Saving Stellagosa will eventually lead players to the Azurewing Repose quest hub. To access this quest, players must first complete the quest chain starting at Illidari Stand before unlocking the quest line that ultimately rewards Emmigosa. I was surprised and super excited when I got her as a pet!!!! I was very engrossed in what I was doing and totally didn't pay attention to what I was receiving as quest rewards. 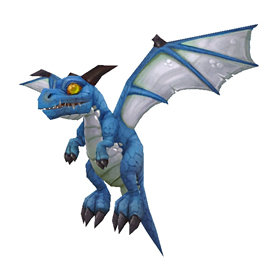 I had been hoping that I would be able to get one of those adorable little blue dragons as a pet, and then I did!!! she is a magical beast (not beast type, I just mean she is good), I have been using her with my Chrominius for some entry level "howl bomb" style stuff... if something is weak to magic, you can garuntee to 1 shot with emigosa, especially after a howl from chrominius.. I am still pretty new at this so just trying stuff out, but I can see this little guy being MVP of legion. The great-great-great-great-great granddaughter of Senegos.